Having good food is the best solution to our problems, it's my theory. 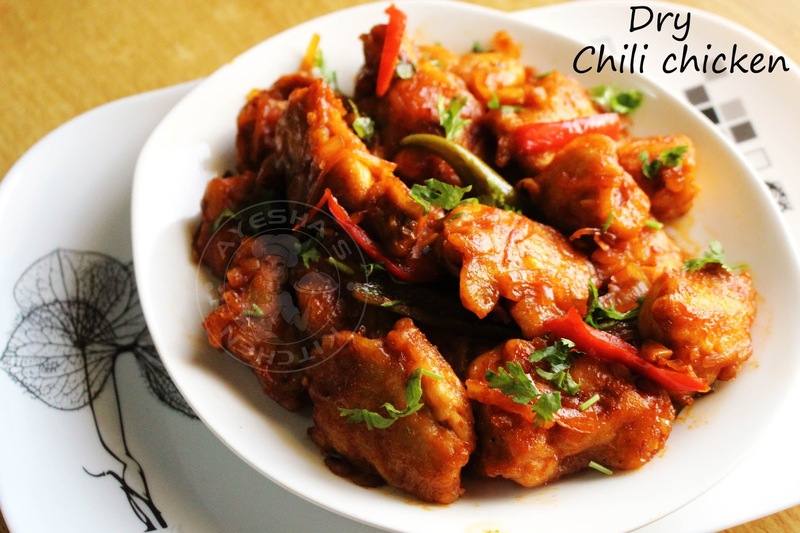 Chicken chilli dry recipe is an addictive, crispy, crunchy, succulent and moist chicken recipe which i often make at home. I love and crazy about Chinese food though my family doesn't. This recipe for chilli chicken is my favorite of all. Chinese cuisine is one of the World's greatest and much popular cuisines. Chinese food / Chinese restaurant is famous all over the world with countless delicious and fantastic dishes. So here am back with yet another chicken chili recipe after my Chicken chilli gravy recipe. 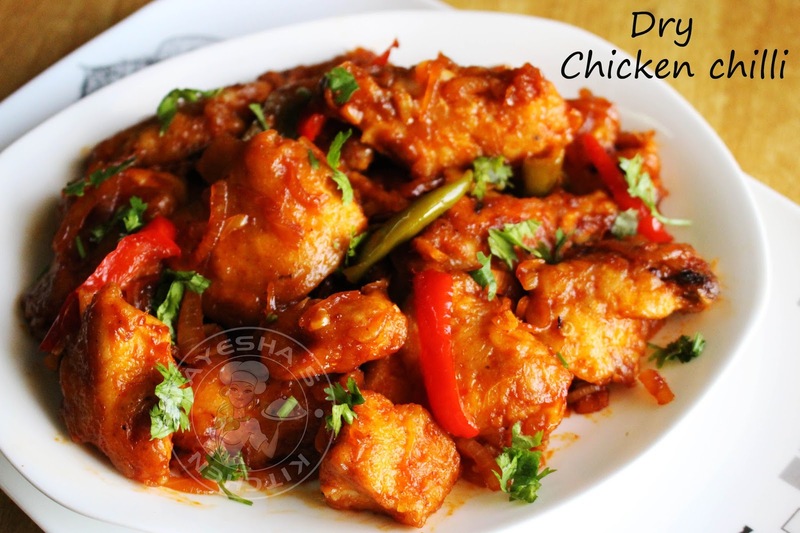 Hope you will give this chicken recipe a try and let me know how it turns out for you. A must try simple Chinese chicken recipes. Cut chicken into bite sized pieces and set aside. In a bowl, add all purpose flour, cornflour, ginger garlic paste, soy sauce, pepper powder, and salt. Mix them well by adding little water. Marinate the chicken chunks with this marinade and set aside for few minutes. Now heat some oil in a non stick pan (i prefer nonstick pan to avoid sticking from the bottom). When hot, drop the chicken one by one and fry it until golden. Set aside. Meanwhile, you can also make the sauce in another pan. Heat butter in a pan and saute ginger and garlic until golden over a medium flame. To this add finely chopped onion, green chilies, sugar, and salt. Saute well. Now in a bowl mix together tomato sauce, green chili sauce, soy sauce, vinegar and red chili powder very well. Add this to the sauteed mixture and combine very well along with some water. Cook it until oil separates. When done, add the fried chicken and toss well in the sauce mixture. Serve hot along with fried rice, chappathi, noodles.